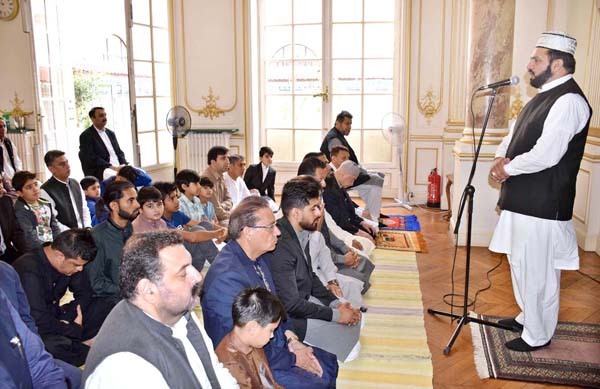 ISLAMABAD, Aug 21 (APP):Pakistani community in France Tuesday celebrated Eidul Adha with religious sanctity and fervor. Special arrangements were made at the Embassy of Pakistan in Paris where community members, officers and staff of the embassy along with their families offered Eid prayers in large number, a message received here from Paris said. Ambassador of Pakistan to France Moin ul Haque in his message to the community termed Eidul Adha as an important festival celebrated in memory of the supreme sacrifice of Prophet Ibrahim (AS) which reflected his absolute submission to the will of Allah Almighty. He said Eid is a great opportunity to extend compassion and kindness to the less fortunate and prayed to Allah Almighty to bless all Pakistanis and Muslims around the world with the true happiness and understanding for the great religious act of sacrifice. The ambassador also extended his warmest wishes to the Pakistani community in France and congratulated everyone who performed the Hajj this year.